My brother lives in France, my sister-in-law is in Dubai and I have friends in far away places like Australia and Swindon so I love being able to keep in contact so easily. I know I said this in my last post but Facebook seems so much more personal than Twitter. Although I mostly use Facebook for friends I have 'liked' a few pages; the University of Southampton library, Hampshire Constabulary (always interesting to read the comments under any of their posts) and Sophos Naked Security. That last one is great for picking up changes to Facebook privacy policies as soon as they happen and gives useful, non-patronising advice. I belong to one Facebook 'group' that a friend set up. Anything we post to the group can only be seen by other group members so it's an excellent way of all staying in the loop without having to think about who can see what we're writing; to me it is a very useful feature. I'm not sure if I should say this so I'll whisper it...I'm not convinced of the value of university libraries having Facebook pages. I understand that different people like to access information in different ways but I think of all the means we have of communicating with our users Facebook and Twitter are the least useful. I have looked at various official university library Facebook pages and none of them seem to reach a very large audience; the numbers of likes for all of them is a small percentage of the number of likes the official page for each institution has. The library Facebook pages that are reaching a larger audience are the unofficial ones, like a page for commenting on amusing graffiti in the toilets for one university library, or where people can comment on students they've seen in their university library (I'm not naming them but they're not hard to find). I see that a valuable use of library Twitter and Facebook pages is broadcasting urgent information, such as snow closures but otherwise I'd put my money less on social networking forms of communication and more on email, the website, Live Chat, phone enquiries and good old face to face help at the Reception, Loans and Enquiries desks. 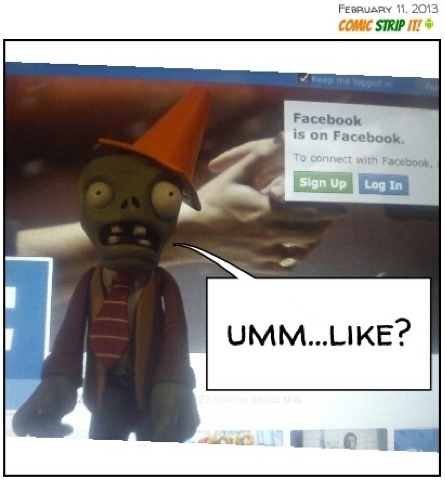 If I had my own academic library would I have a Facebook page? Probably, but more because other academic libraries do than because I think it's a priority. I would be aware that I would need to invest staff time in maintaining the page, keeping it up to date and engaging. I would consider using questions received via other enquiry routes that might be of general interest and repurposing them on the Facebook page (without identifying the original enquirer of course) in the hope of sparking further queries directly from Facebook. I would also have the member of library staff posting on Facebook give their first name, in the same way we do for Live Chat queries, to make the user experience more personal and friendly. We've been asked to think about possible problems with having a library Facebook page. Two spring to mind; firstly finding the staff time to maintain it/post something relevant to most users on a regular basis/answer queries and secondly the possibility that people may use it as a place to vent frustrations, for example if they had poor exam results and wanted to complain for the sake of complaining rather than for constructive reasons. Oh, and there's always the chance that people will 'like' the page and then use it to advertise their business/services by posting, which may make it look like the library was endorsing the product or service.